A month after protestors took to the streets in New York against greed and corruption in Wall Street, anti-capitalist protests spread across the world. Similar scenes took place in the financial district of major cities in more than 80 countries as far apart as Frankfurt, Hong Kong, Sydney and London. In Rome police had to deal with outbreaks of violence but in other cities the protests were peaceable. 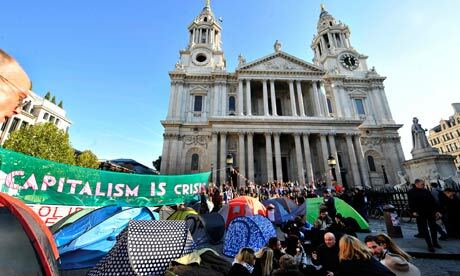 In London the protesters set up camp in front of St Paul's and although initially cathedral clergy supported the action, the size of the camp made it difficult for visitors and worshippers to enter the building, which was closed for a period on grounds of health and safety. Meanwhile political leaders, with their financial advisers and economists, from all over Europe gather for one summit after another amid dire warnings of the consequences of the failure to shore up the ailing euro, as Greece and Italy teeter on the edge of bankruptcy, with Ireland, Portugal and Spain all in the relegation zone. The finest brains among the most advanced nations in the world struggle with the complexities of how to unravel the crisis in the world’s financial systems that has been brought about by human greed. I wonder in the midst of this entire crisis is there a ‘God dimension’ to consider? Could this help? I believe there is a moral law that is woven into the fabric of creation, which we ignore at our peril. It is as immutable as the laws of nature and its consequences are as inevitable as defying the law of gravity. The writer Paul, in the New Testament says that ‘greed is idolatry’ – is it the worship of wealth brought about through selfish desire that cares for no one else? Is it this selfish drive for personal gain that lies behind the present predicament in the world's economy? Would we have never got into these problems if it was not for greed, maybe this is being recognised by some, hence the protest movements. How do we change the whole basis of our individualistic, materialistic, self-centred culture? The only way I know is through the message of Jesus who turned the world’s values upside down. After 2000 years of trying every other way, is it time we took a closer look at the teaching of Jesus. Could it be that he made it possible for human beings to be released from the social and moral forces that enslave us and he enabled us to experience a radical change of mindset and lifestyle?